ZeroG flights make it possible to experience true weightlessness, allowing bodies and materials to float free of the earth’s gravitational pull. The S3 parabolic flights are completely safe, and supervised by space professionals and a crew of qualified personnel. All flights last less than 2 hours, during which 15 parabolas are performed, each providing an experience of weightlessness for 20 to 25 seconds. “This ZeroG experience is a first step towards our objective of Space for All, giving everyone a chance to enjoy the weightlessness experienced by astronauts in space, but at an affordable price”, explains Pascal Jaussi, Founder and CEO of S3. In this zone, which caters for up to 40 passengers, ZeroG is available for under 2’000 Euros per head. This is the world’s most affordable ZeroG experience. This luxurious section offers more room for each of a maximum of 28 passengers. Premium Zone tickets cost 5’000 Euros and include special activities such as playing with liquids and balloons. Passengers will receive an exclusive Breitling S3 ZeroG personalized watch, which will serve as the passenger’s boarding pass. This very exclusive part of the plane welcomes up to 12 passengers at a cost of 50’000 Euros for the whole zone, with a range of extra options available for a tailor-made experience. VIP passengers will also receive an exclusive Breitling S3 ZeroG personalized watch. To offer weightlessness to as many people as possible, the S3 ZeroG aircraft will not remain in Switzerland. On the contrary, S3 committed to operate a world tour in order to share this ZeroG experience all around the globe. However, offering and preparing this experience worldwide is proving not to be an easy task, along with issues on a new European legislation related to these types of flights which are among the main causes to the modification of the overall flight schedule. After the Swiss opening campaign during the second half of 2015, flights will be proposed in North America, with stops in Canada, western United States, and in Florida, where more than 25 flights will take-off from the Kennedy Space Center at Cape Canaveral. During this campaign, microgravity research experiments will be also operated, and the new interactive communications system designed for life science microgravity payloads developed by S3 and Spacepharma will be put to the test. The S3 ZeroG tour will continue in 2016 with some of the destinations previously planned for 2015, including Japan, which was initially scheduled to be the first stop in January 2015. New destinations could be added to the world tour 2016 with a schedule to be released in the course of 2015. 2’000 Euros is a bit expensive (500 bucks shall be enough), but that is a price, range where it becomes interesting to book it. Couldn’t you just rent a Cessna Caravan for an hour and get the same thing for less money? Or are only jet aircraft capable of this type of flight? The Cessna might be to slow for longer, wished weightlessness periods up to 30 seconds. I guess the Cessna reaches only 5 seconds ((300 km/h/800 km/h)^2*30 seconds). you can perform parabola flights with propeller aircraft, but most don’t have the performance characteristics needed to perform such maneuvers, which also put a great deal of strain the airframe. the Mercury astronauts did some training in a C-131B propeller driven cargo aircraft, but it could only produce 10-15 seconds of weightlessness, compared to 30-40 seconds with a jet aircraft. my gut instinct is that such acrobatics would be pretty hazardous in a Cessna. Only a little slightly less than factual! If any company could get it down to $500 bucks I bet a lot more people would buy a ticket. Hmmm. How much did Zero-G costs for a seat? But they let you vomit several times on the trip, included in the price! Na, I think this is a great idea. Competition will soon imitate it at lower and lower prices. And this is why suborbs have nothing to offer. An old airplane does what they tried to do. But much cheaper and simpler. And because of the multiple microgravity experiences per ride, maybe even better. Wow For a whole 15 parabolas + vomit. yup, though vomit not guaranteed, since that varies from person to person, but i imagine their cleaning costs are significant. really though, some of the money is going to fuel, most to aircraft maintenance. 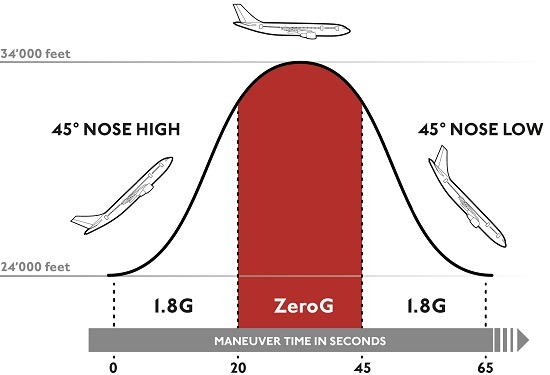 as i posted earlier, the stresses on the engines and the airframe are greater than the typical operating conditions, you’re going from over 2 g to 0 g and back to 2 g in just a few seconds, likewise engines go up to full throttle to low throttle and back, etc. it puts a lot of wear and tear on the engines. Yeh, if you can fly across a complete ocean for 500 bucks, then it this event also possible …. Actually, this is the competition. Zero-g has been in the us for last couple of years. I am wondering if zero-g will be smart, drop their prices and tour america? That is for the “cheap” seats. The VIP seats cost 50,000 Euros. ah, my figure is what the “Zero G” experience in the USA cost. I’ve got over 2600 parabolas under my belt, divide by 15 x $5000 = I got paid to do something I would have done for free! Actually if they catch you boofing into a bag they usually take your picture so everybody knows. The VIP area costs 50,000 euros to rent for 12 people.